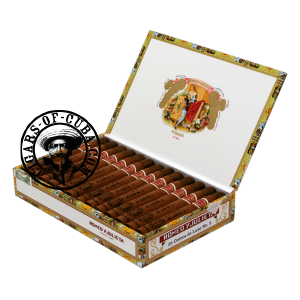 Herbal and woody aromas nestle in this delicate cigar that is accessible to beginners and seasoned smokers alike This Corona is mild by Romeo standards, although more direct than it's bigger brother, the No.1. A great maturation and subtle complexity mark this underrated aficionados secret. Can be enjoyed young but does improve drastically with time. One of the most appreciated Cedar wrapped Cuban cigars by beginners. It's mild and refreshing, typically a spring cigar.